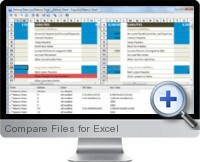 Compare Files for Excel is an add-in for Microsoft Excel. It compares workbooks, worksheets or specific ranges with its own smart algorithm. It detects added and deleted data in spreadsheets. Compare Files for Excel comparison results are shown exactly as they looks in original Excel workbook. Modifications are marked with color in a Report Window and can be exported to worksheet or text file. Differences may be resolved by applying them to each file: undo the changes in a newer version of a file or apply the same change to an older version of a file. Compare Files for Excel is also useful for version control.